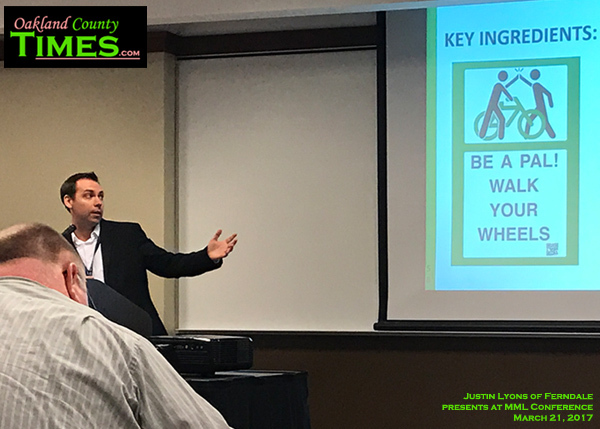 Representatives of Ferndale, Ann Arbor and Kalamazoo sat on a Michigan Municipal League’s Capitol Conference panel Tuesday to share what successes their communities have had with Complete Streets projects. Having complete streets means that roadways are designed to be safe and welcoming for multiple forms of transportation, including cars, pedestrians, bicycles, public transit and accessibility for those in wheelchairs and walkers. In terms of safety, Michigan ranks 9th most dangerous for bicyclists with 24 deaths per year Smith said. “This is basic stuff like paint and lighting,” Smith said. A study by Christopher Leinberger looked at increases in real estate values in correlation to Complete Street features, including increasing retail space value by $9 per square foot, apartment rental rates by $300 per month, and home values of $82 per square foot. In Ann Arbor they went from 0 miles of bike lanes in 2000 to 60 miles today. Rebekah Kik, City Planner for Kalamazoo got hands on experience working with the public to understand the value of Complete Streets when the city decided to make changes to Portage Street. Portage has an airport at one end and a downtown at the other end. The posted speed was 30, but the average speed was 42. “Our vision was working with community members and business owners to discuss trade offs and street design,” she said. 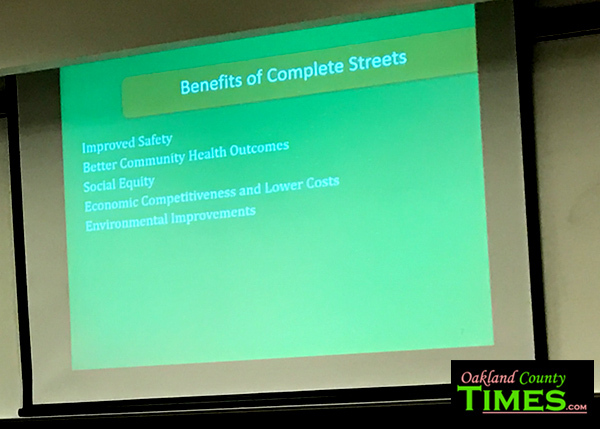 One cost savings was that by reducing the width of the road there were huge construction savings and savings on maintenance over time. They had to choose between bike lanes and on-street parking. Ultimately they chose the bike lanes because they wanted people to feel safe biking and walking in the area. The idea went over well because she told people they could do the bike lanes relatively easily and see how they worked out before spending money on setting up the on street parking. After the reduction of lanes and addition of bike lanes, they saw a 47% decrease in the number of crashes. “Now you can hit every single green [light] if you go 30 miles per hour,” Kik said. Ferndale City Planner Justin Lyons talked about how various small initiatives have been adding up to make Ferndale a mecca for Complete Streets features. Ferndale adopted a Complete Streets ordinance in 2009 and has been using it actively since. “In the 90s Ferndale was a pass through city. Now it’s a destination,” Lyons said. 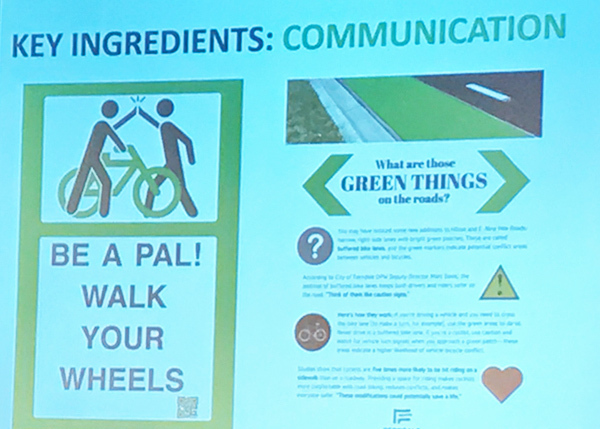 Working with neighboring communities Ferndale was able to get 142 bike route signs, 4 rapid flashing beacons, shared lanes markings, 3 wayfinding hubs that include bike repair stations, and new bike lanes. In Ferndale they’ve encouraged employees to be innovative, including creative signage in the Downtown asking people to “walk your wheels” when Downtown, and the DPW retrofitting a sidewalk sweeper to do winter clearing of protected bike lanes and crosswalks. “Our Mayor and City Manager are good about saying ‘don’t tell me why it will not work, though they will listen to that too, but tell me how we can make it work,” Lyons said. Coming up next for Ferndale’s Complete Streets efforts is “Bike Month” in May, when the community will have several bike-related events and promotions to encourage multi-modal transportation. While bike lanes and pedestrian crossing are part of the street design, public transit also plays a role in Complete Streets. Streetscape and Complete Streets planning can ensure that buses, ride sharing services, electric cars, and self-driving cars can all have a place as well as pedestrians and cyclists. 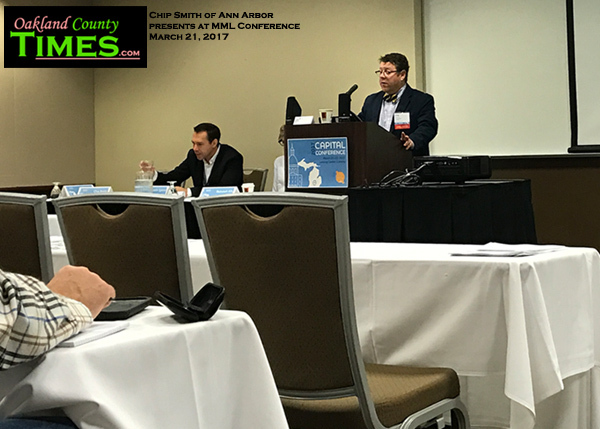 The Michigan Municipal League 2017 Capital Conference took place March 21-22 in Lansing. 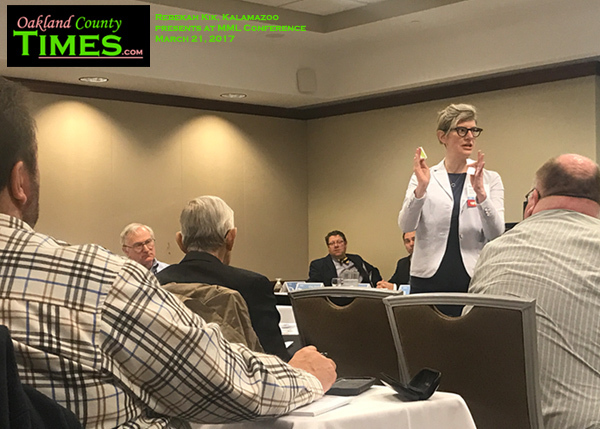 Oakland County Times will be featuring stories from the conference over the next few weeks. If you’d like to sign up for daily headlines from Oakland County Times go to https://feedburner.google.com/fb/a/mailverify?uri=Oakland_County_115_News.